fashionably petite: Welcome Back to Mercedes-Benz Fashion Week HauteLook! Welcome Back to Mercedes-Benz Fashion Week HauteLook! I just wanted to welcome HauteLook back to New York for Mercedes-Benz Fashion Week! 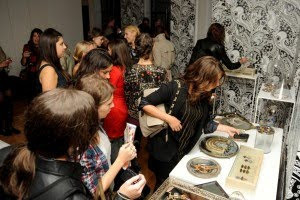 Last season the HauteLook Lounge hosted various presentations and previews. This season I'm looking forward to checking out the Decades2 trunk show and Rachel Pally preview. The HauteLook Lounge is a great retreat for press and VIPs to unwind with a drink or makeover, check email or catch up on blog posts on Signature Collection VAIO® laptops, provided courtesy of Sony Style, as well as complimentary Wi-Fi. Thanks to HauteLook, I got to try some new beauty products and indulge in some favorites from Lorac, Arcona and Benefit. If you aren't familiar with HauteLook, the site hosts private, limited time sales, featuring top designer brands for women, men and kids, as well as home and beauty products such as 7 For All Mankind, Herve Leger and Kevyn Aucoin. It's like attending a sample sale without the waiting and long lines. You can get your favorites at 50-75% off, with new sales starting each weekday at 11AM ET. You can also find out what sales are coming up ahead of time. You can even check out designer videos to get a sneak peek at what type of items might be available during the sale, or get familiar with each designer's style and pieces. There's also an incentive to invite friends - you get a $10 credit each time a friend makes their first purchase. You don't have to twist my arm to shop! You never know when you might find a good deal!